To better understand how retinas develop, University of Idaho biological sciences professor Deborah Stenkamp studies the eyes in growing zebrafish embryos. “The best way to learn this is just to watch it in real time, as development takes place,” Stenkamp says. 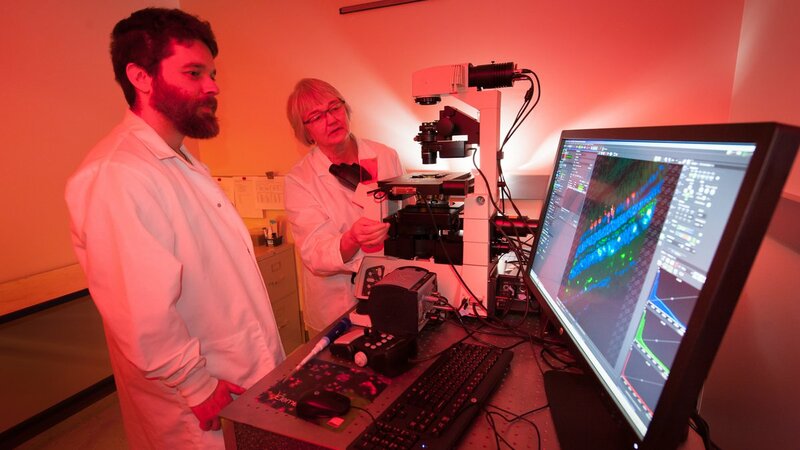 Now, with grant support from the M.J. Murdock Charitable Trust and the National Institutes of Health, Stenkamp and her students can witness cells in action using the university’s new dynamic imaging system. 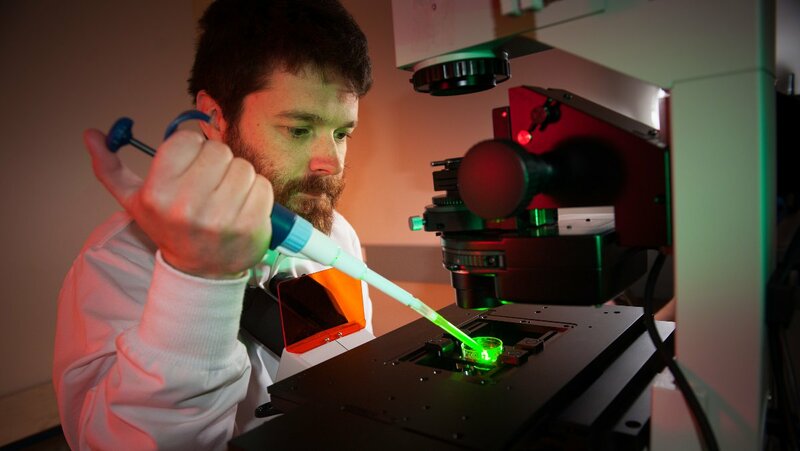 The live-imaging microscope, installed on campus in November 2014, provides a controlled environment for cells, tissues and small organisms to move and grow. High-speed cameras and an automated focusing device are used to create images of multiple fluorescent labels in the cells and high-resolution time-lapse movies, capturing the action over milliseconds, seconds, hours and days. 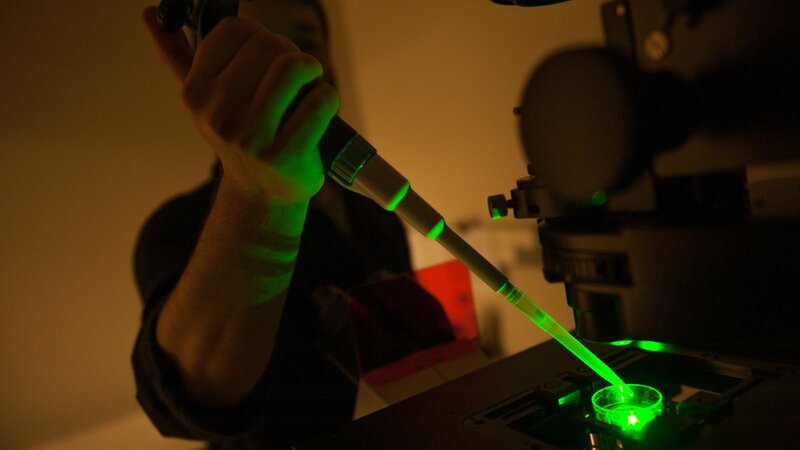 The live-imaging microscope provides a controlled environment for cells, tissues and small organisms to move and grow. The new microscope will prove useful for more than a dozen research programs on campus, as well as help draw new researchers, says Ann Norton, director of U of I’s Institute for Bioinformatics and Evolutionary Studies (IBEST) Optical Imaging Core, where the microscope is housed. “We have more investigators looking at things at the cellular or even the molecular level,” Norton says. The microscope’s capabilities allow researchers to run experiments more quickly and efficiently, using fewer resources. They can examine changes as they unfold, rather than needing to prepare multiple static samples from specific points in time. “We were missing things before, perhaps, and now we can catch them happening,” Norton says. Stenkamp’s research has already benefited from the instrument. The ability to create high-resolution and live images gives her team versatility as they study how specialized cells form in the retina, how they interact with blood vessels, and how zebrafish’s retinal cells can regenerate. Students can witness cells in action using the university’s new dynamic imaging system. “Understanding how this works could mean we find the key to regenerating human retinas after damage or trauma or disease,” she says. And not only does Stenkamp benefit, her students do as well. “Another added bonus is that students, post-docs and other trainees will get to use this magnificent equipment, and that training will be useful later in their careers,” she says. Onesmo Balemba, an associate professor of biological sciences at U of I, and his students have also been using the microscope for their research. In one project, they’re identifying new molecules from the Garcinia buchananii plant, which people in sub-Saharan Africa use to treat themselves for diarrhea, abdominal pain and other digestive issues. Balemba hopes to identify a molecule that could eventually be used in place of opiates to treat bowel problems — and the microscope allows his team to study how the molecules work by witnessing firsthand their effects on nerve cells found in the gut. The microscope’s capabilities allow researchers to run experiments more quickly and efficiently, using fewer resources. A second project investigates how high-fat diets in mice lead to nerve cell injuries, which are a characteristic of type II diabetes. Again, the microscope makes this research — which Balemba says could be the first of its kind in the world — possible.